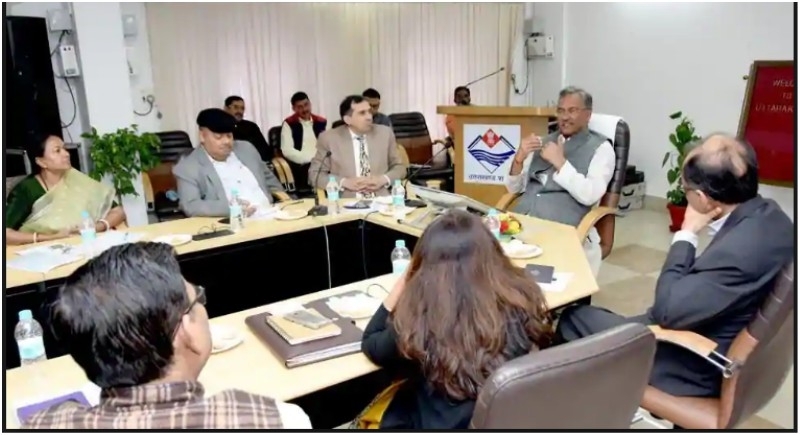 Dehradun, February 5: Changes were made in the responsibilities of more than a dozen IAS officers by Uttarakhand Government on Monday. The revenue board chairman S Ramaswamy has also been made the chairman of Uttarakhand Transport Corporation while additional chief secretary Om Prakash has been relieved of State Estate, Skill Development, and Employment. Additional chief secretary Ranveer Singh has been relieved of Forest and Environment while his other responsibilities have remained the same. Principal secretary Manisha Panwar has been relieved of the post of director general/commissioner of the industry. Similarly, principal secretary Anand Wardhan has been relieved of minor irrigation, irrigation, soldier welfare, food, civil supply and consumer affairs and post of commissioner of food, civil supply, and consumer affairs while being accorded the responsibility of principal secretary, forest and environment. Secretary Bhupinder Kaur Aulakh has been relieved of school education (primary and secondary) and accorded minor irrigation and irrigation. Secretary Sushil Kumar has been made the commissioner of food, civil supply and consumer affairs while secretary R Meenakshi Sundaram has been given school education (primary and secondary education). Shailesh Bagauli has been relieved of the post of Garhwal commissioner with BVRC Purushottam being accorded this post. Nitesh Kumar Jha has been relieved of the post of personnel and vigilance secretary. Harbans Singh Chugh has been relieved of the post of secretariat administration secretary while Arvind Singh Hyanki has been accorded state estate in addition to his current responsibilities. Ranjit Kumar Sinha has been made the secretary (in-charge) of skill development and employment while Indudhar Baudai has been made secretary (in-charge) of secretariat administration in addition to his current responsibilities. Brijesh Kumar Sant has been relieved of the post of Uttarakhand Transport Corporation managing director and made director general/commissioner of industry. Bhupal Singh Manral has been made the secretary (in-charge) of soldier welfare while R Rajesh Kumar has been made the managing director of Uttarakhand Transport Corporation in addition to his current responsibilities. Deependra Kumar Chaudhari has been made the managing director of Uttarakhand Sugar Federation in addition to his current responsibilities. Among the PCS officers, Meherban Singh Bisht has been made the additional secretary of mining in addition to his current responsibilities while Pradeep Singh Rawat of the secretariat services has been relieved of the post of Uttarakhand Sugar Federation managing director.